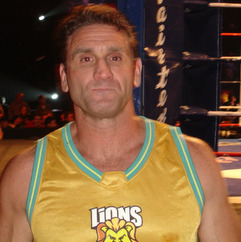 Kenneth Wayne Shamrock is an American mixed martial artist, Ultimate Fighting Championship Hall of Famer, and professional wrestler. Shamrock emerged as one of the biggest stars in the history of mixed martial arts, headlining over 15 main events and co-main events in the UFC and Pride Fighting Championships during the course of his career and set numerous pay-per-view records with his drawing power. Shamrock is widely considered to be a legendary figure and icon in the sport of mixed martial arts. Shamrock was named The World's Most Dangerous Man by ABC News in a special entitled "The World's Most Dangerous Things" in the early part of his UFC career, a moniker which has become synonymous as his nickname. Shamrock became known early on in the UFC for his rivalry with Royce Gracie. After fighting to a draw with Gracie in the inaugural Superfight, he became the first UFC Superfight Champion after defeating Dan Severn at UFC 6; the title was eventually renamed the UFC Heavyweight Championship when weight categories were introduced to the UFC. He was also the first foreign MMA Champion in Japan, winning the title of King of Pancrase.